Submit your crappie pictures to our website here. Look at photos and stories of crappies submitted by other contributors. Review, Rate, and Comment on any of the ones that you would like to. Totally kidding, there's no such thing as some of those mentioned above. But, I suppose it all depends on how you captured the moment and tell your fish tales ;-) You never know, some people actually believe in unicorns too. If you, a family member, or a fishing buddy has any pictures of crappie, we would gladly like to see it. Share your catch with the rest of the freshwater fishing community. The self proclaimed "Crappie King" in Royal form. There's no crappie fish too small or too big. So don't be shy, and don't be modest. Brag and boast as you wish. If you caught just one, or a nice stringer to fill up an entire ice chest, send in those crappie pictures and tell us your story behind catching them. 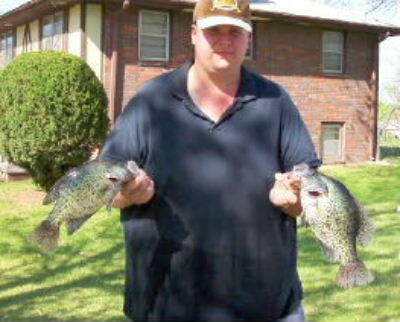 Even if you have a replica or any crappie mounts, take a photo and upload it with your story. It must be worth talking and bragging about if you took the time and money to have it mounted, right? Perhaps your Dad, brother, best friend, boyfriend, girlfriend or even your Mother might have a crappie mounted on their bragging wall in the den... shoot a couple pictures and send them in. And then you can show them that they have their very own web page on the internet for the world to see. So, what are you waiting for? Share your crappie fishing pictures and stories with us today. We would be happy to see your slabs. Entering your story is easy to do. Just type! Write as much as you would like, try to make it about 300 words. Brag, boast, or remain modest. Provide details if possible. Caught this crappie in Coleman, Texas on June 1, 2014. Got 'em beside a sunken tree trunk using a small jig. Caught this beauty last fishing season. Do you like art? Looking for posters? Nothing 'crappy'. (Yeah, sorry for the intentional pun.) Anyways, I'm referring to some excellent artistic prints, posters, paintings, photographs, wall decals and other types of art capturing the essence of crappie fish and freshwater fishing. Perhaps you would like to add a newly framed crappie poster to your collection of panfish memorabilia. Get started by checking out a few of the items listed here below.